Harnessing the power of Industrial Internet of things (IIoT) is no more an option but a necessity for vertical business enterprises that would like to enhance productivity. CSI understands this need perfectly and hence have created a robust IIoT cloud platform that integrates and manages your data with all stakeholders – clients, vendors, devices, sensors, websites, and machines. Being hardware and transport-agnostic, our IIoT Platform built on Kaa Projects seamlessly connect with all your production facilities and enable many-to-many interoperability among them. By virtue of our rich expertise and robust partnership with system integrators, we devise immaculate automation designs that are completely devoid of complexity. All crucial parameters of machines and devices spread across any geographical location are captured and gathered through sensors, remote devices, and machines PLCs. Data from these sensors are routed through centralized hub and transmitted further for cloud computing. Huge and versatile data are processed through robust big data engines to extract intelligence out of it. Picked out data and intelligence are communicated via customized mobile apps to provide real-time insights of business processes and productions operations. Our IIoT cloud presents a crystal clear view of your Big Data and offers superior connectivity with most of the hardware across multiple languages. Manage unlimited devices and machines from anywhere for their real time performance monitoring, controlling, up-gradation, device provisioning and configuration. Unleash the robust nature of CSI’s IIoT cloud technology to collect and analyze sensor data and carryout complex processing of them to trigger real time changes. Make devices across production lines to be more responsive, infuse ability for instant changing of configuration settings with the help of interoperability and unified data sharing features. Customize algorithms for data analytics to enhance your device performance. 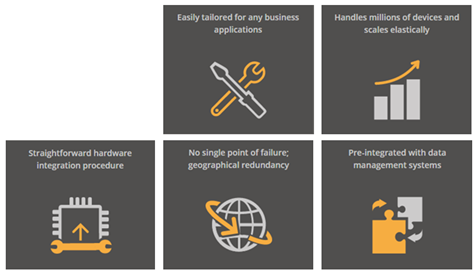 Reliable and easy detection of failures and troubleshooting. Being hardware- and transport-agnostic, it can be easily integrated with a broad variety of sensors, controllers, machines, and device gateways, enabling many-to-many interoperability between them. Through this interoperability and unified data sharing, separate parts of the production line become more responsive and capable to instantly react to different events or change their configuration settings accordingly.